First things first: how you’re week going so far? I know it’s only Wednesday so you might be smack dab in the middle of work – but at least we’re coming up to an extended weekend with Easter coming up! Have you already stuffed yourself full of chocolate eggs or are you saving those for Sunday? With all the holiday treats coming up I figured I needed to pack in a few more greens here and there to keep things fresh. I started out with just spinach & asparagus but soon after threw in some bacon because bacon and asparagus were made for each other. 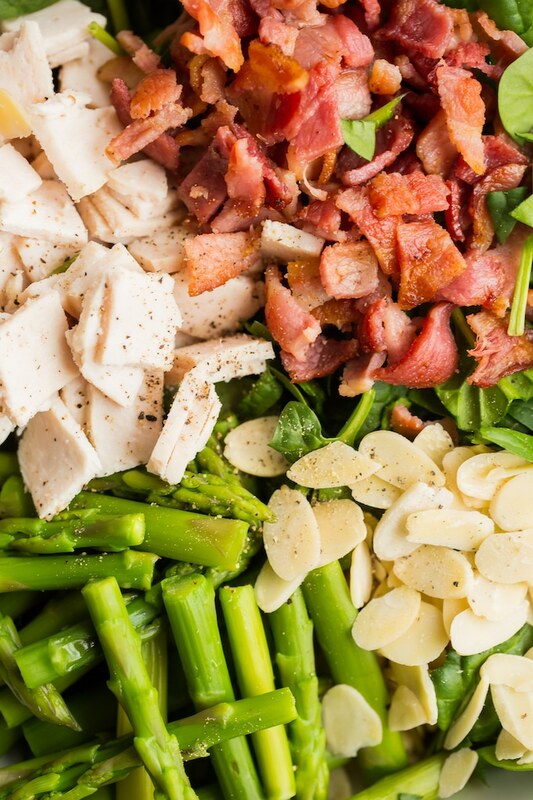 And then after a couple more minutes I ended up with this Chicken Bacon Spinach & Asparagus Salad and all was right in the world. 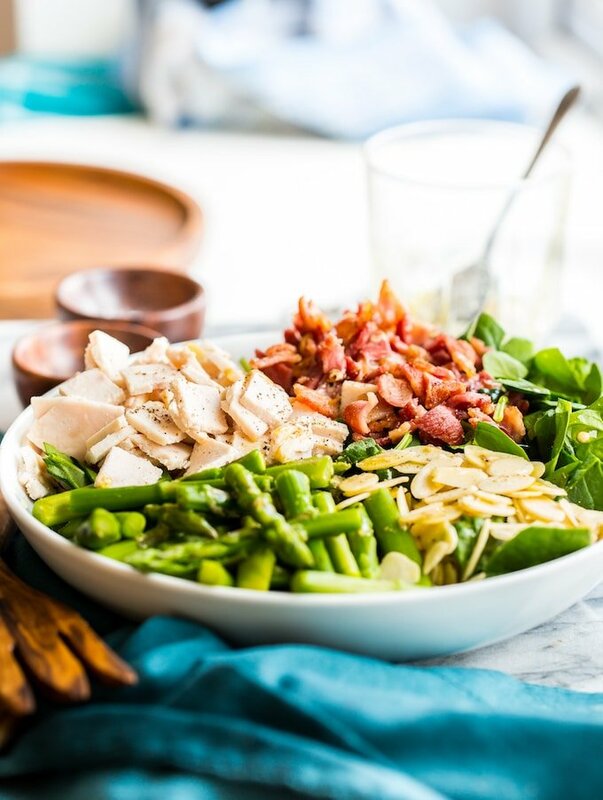 This asparagus salad is super easy to make and made with fairly minimal ingredients. It all starts with a quick asparagus boil. All it needs is a few minutes in some boiling water – just enough to soften the stems but not long enough to turn them mushy. You may need to adjust your boiling time slightly depending on how thick or thin your stalks are, so just keep that in mind as you cook. Once the stalks are nice and tender drain the water and quickly rinse under cold water to stop the asparagus from continuing to cook. Then just set aside. Moving onto the bacon: lay out your bacon strips on to a large, cold skillet and cook on a low heat. The fat will fender and the bacon will begin to cook/crisp in a matter of minutes. Flip the bacon pieces over and back as needed until they’re completely crisp and then remove from the heat to chop into little bacon pieces. For the chicken, I chose to use sliced deli meats. It’s fast and easy and what I had on hand. If you prefer you can always throw in breast from a rotisserie chicken instead – whatever you’d like! The vinaigrette is simple and punchy. It’s just a mixture of: olive oil, red wine vinegar, salt & pepper. Mix it all together and pour over the salad. Season with a little more salt & pepper as needed. Pepper, in my opinion, is not used nearly as much as it should be in salads. This salad is filling but not too heavy and really packs in a lot of flavour – especially considering how easy it is to make. 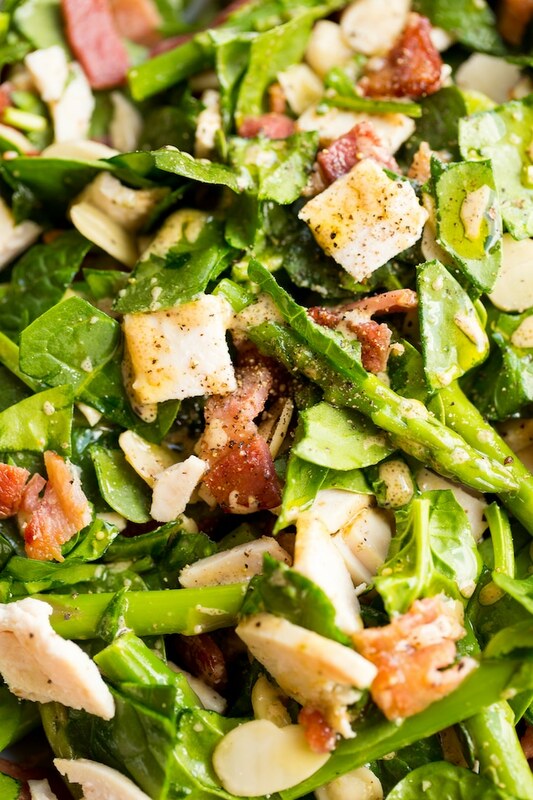 Don’t forget to #asaucykitchen on instagram if you try this Chicken Bacon Spinach & Asparagus Salad! We love seeing what you make! You can also post your pictures to my facebook page! Bring a pot of water to a boil. Add the asparagus and cook 2 to 3 minutes, until slightly tender but still firm. Drain the water and run the asparagus under cold water to stop it from cooking. Set aside. To cook the bacon: lay the bacon strips out flat on a cold pan. Turn the heat on low and let the bacon cook for a few minutes before flipping and cooking the other side until crispy. Remove from heat and chop into little bite sized pieces. 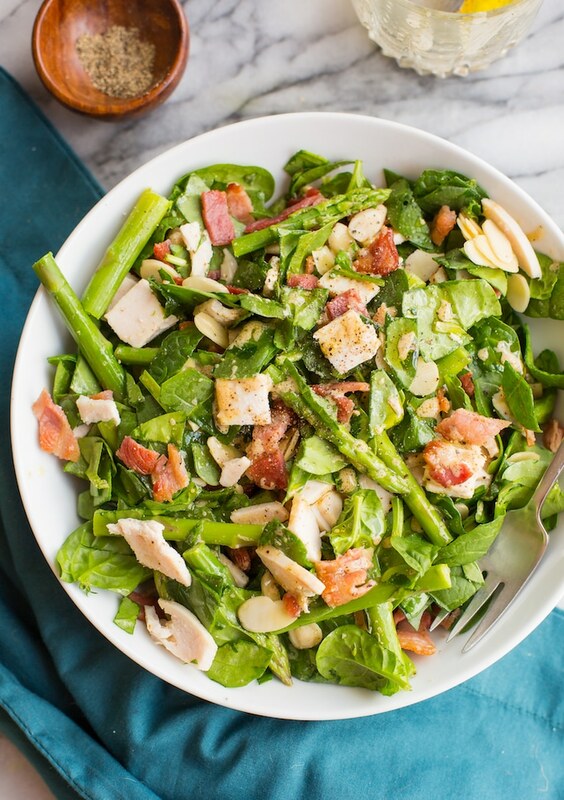 In a large salad bowl toss together the spinach, asparagus, bacon, chicken and almonds to combine. Drizzle the vinaigrette over the top of the salad and season with more salt and pepper as needed. Enjoy! 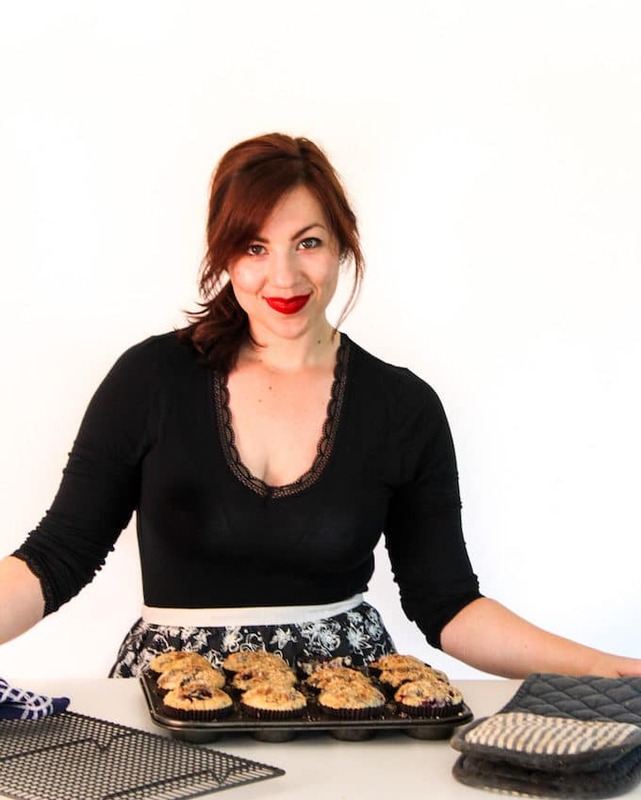 In a small cup or bowl whisk together all of the ingredients. Set aside until needed. For low FODMAP: check that your bacon isn't cured with high FODMAP sweeteners like honey or high fructose corn syrup. Also make sure to choose a garlic free mustard. Love this! Will definitely be making this salad soon! Thanks for sharing!